This episode was another reasonably funny outing. I’ve been reluctantly impressed with season 12 of this show in general it has to be said. The plots this week are double barreled, the A plot being that Peter realises he can get extra breaks by taking up smoking and this story plays out as you might expect. The second is that Chris is being bullied at school and Stewie helps him fight back with some witty verbal repartee that makes the bullies think twice and the rest of the school respect him. This leads Chris to go insane and not allow Stewie to go anywhere else. 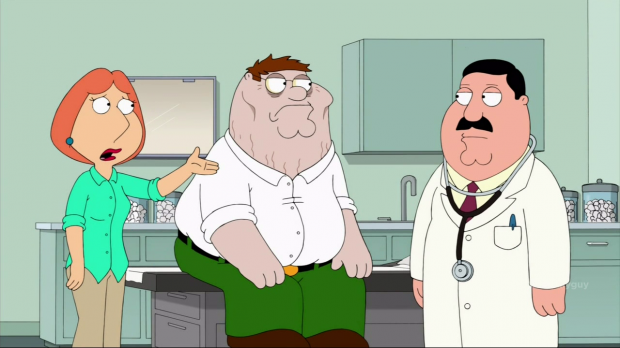 There are a lot of funny jokes in this episode, Stewie’s dialogue that he gives Chris to tell the bullies is spot on and lots of the cigarette smoking jokes are well done, one particular highlight being Peter commenting on how things have better emphasis when said stubbing out a cigarette. That being said, Chris being bullied is something that the show has done before so they are very much retreading the old stories and trying to put new jokes into them, thankfully this is a good example of it but I can see it going south pretty quickly. I hope Family Guy can keep up the momentum it seems to have recaptured as it is almost feeling like the good old days. A new comedy show started and I thought I’d check it out, mostly because James Van Der Beek in it and he has proven himself to be hilarious in other things. I’m delighted to say that here is no exception, his sarcastic wit is top notch here. The highlights of the episode are when his character, Will is making layered references to other things, the character is juvenile but Van Der Beek pulls it off nicely and is pretty watchable. I can see the routine quickly becoming tiresome, I don’t think this can be funny for too long. The same positive things can’t be said for the rest of the cast who are just so tiresome, the married couple Andi and Bobby have their moments of not being terrible but they are few and far between. The in your face environmentalist Lowell is completely insufferable, Jules has one personality trait – bubbly and that’s equally as insipid. Lastly is Kate, the distant yet successful woman who sabotages her chances at happiness by being superficial. Sound familiar? It absolutely should since we’ve seen it all before, to be honest it’s all pretty wretched but weirdly I will keep watching to see if Van Der Beek continues to make me laugh. Another heavily stacked episode but doesn’t really suffer for it. After the events of last week Jedikiah (look, from now on I’m going to call him Jed, it’s gonna save a lot of keystrokes) is now on the run and The Founder (hereafter known as Bathory) has taken over Ultra, seemingly with the intention of changing it in a positive way. He proclaims that they won’t be hunting down The Tomorrow People and instead will be trying to help them. On the surface this of course looks great, no more conflict between the two groups and some kind of common goal being worked towards, of course that’s dramatically uninteresting so there’s subtext galore. Jed has a point to prove and goes to Stephen’s house to tell his brother everything. This seems to have the desired effect as Luca calls him a mutant and a freak. On the other hand Stephen attacks Jed and clearly has the intent to kill him since his genetic stop button stops him from doing so. Clearly Stephen will never trust Jed so the other angle to try is John who is more ameniable to listening. He concludes that Jed is perhaps telling the truth purely out of self interest but that’s enough for him. John is cautious though and threatens to kill him if he’s wrong. Running alongside the main plot is another breakout who is using his powers to fake a magic act. Ultra get a hold of him through Stephen and Hillary who eventually bring him in. Bathory has him injected with something before letting him go, I’m sure what that thing is will become important soon. The breakout plot has the dual function of further developing the chemistry between Stephen and Hillary which the two actors definitely have. Naturally in true CW fashion Cara is jealous of Hillary but also has John so what we have is some kind of romantic rhombus. Cara makes the assumption that the group is losing Stephen to Ultra due to his connection with Hilary, I find this conclusion to be a bit unfounded as she isn’t really basing it on anything beyond “Ultra is bad”. She has no real reason to mistrust Hillary and certainly no reason to assume that Stephen is becoming some sort of company man because he has the hots for his partner. It does however seem that Stephen is far too trusting of Bathory who convinces him to try a replica of his father’s machine. This seems out of character for Stephen who has spent all this time not trusting Jed and has absolutely no reason to suddenly believe what Bathory is saying. He tries out the machine and finds himself in some kind of limbo where he briefly speaks to his father but is pulled out of it before he can get any information. Overall the episode was very good, seeing Cara acting jealous further helps to give her some personality and stop her from having the same stoic and unflinching expression she seems to wear all the time and the plot moved forward nicely, we’re given extra mystery with the machine amplifying powers but apparently being something that shouldn’t be used. Jed on the run and working for himself is a great place for that character to be, makes him even more unpredictable. It’s also worth noting that this episode is the first time in a while that they’ve mentioned that Stephen is 18 and that he’s at school, I was wondering if they were trying to gloss over that as he hasn’t been to school in quite some time (at least not onscreen) and it seemed to be becoming a non issue as far as his character is concerned. Considering the situations and the way he acts it really makes no sense for this character to be in school, I can’t help but feel that the producers are trying to quietly gloss over it. Now this is more like it. I really feel like the show has stepped up its game this week with not one, not two but four deaths, two of them major characters. One of them was a very shocking WTF moment as well. It seems that the show features 100 teenagers so that it can comfortably lose one or two a week to the harsh realities of living on Earth until the cast is whittled down to a more manageable size, seems fair enough initially but I’m wondering how long it’ll be before it’ll become all The Walking Dead and have death be so frequent that it becomes meaningless. At least for now, that won’t be the case. The main antagonist of this week is some kind of toxic fog that does all sorts of horrible and nasty things to the people it encounters. Two barely named extras as well as poor Adam are the unfortunate souls to be caught in it. The fog may be lifted straight out of The Hunger Games: Catching Fire but it is as effective here, the effect it has on Adam is brutal and the show does a good job of selling just how lethally dangerous it is. Adam is in so much pain that Clark has to perform a mercy killing which says a lot about her character. She has been established as compassionate but now we see that she is willing to do what it takes when nobody else well, I liked to see that about her as it shows an innate strength to her that will be fascinating to explore. 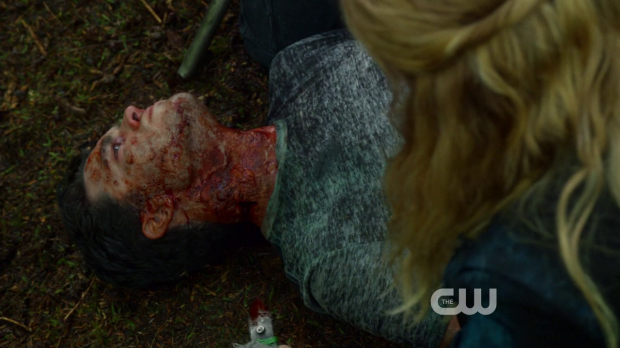 Another main focus of this episode is Clark fighting to save Jasper, using her medical knowledge as well as the knowledge of those around her to boil up medicine for him, she also notes that the “Grounders” have cauterised his spear wound which tells us that they’re not as savage as we have been led to believe in the whole one episode that they have been mentioned in. Predictable but I’ll let it slide until I see where they go with it. Of course it’s not so easy for Clark to accept Wells’ help due to the other plot in this episode, we are shown several flashbacks to one year previously on The Ark detailing the time that Clark’s father discovered the oxygen issue that is now their rapidly ticking clock. The personal issue comes from the fact that her father was supposed to keep the system failure a secret but didn’t want to so was planning to tell everyone anyway because he felt that they had the right to know but Wells sees fit to tell the Chancellor about this before it can happen. Resulting from this is Clark’s father “floated” which is what this show calls – being exposed to the vacuum of space via airlock. Brutal punishments here. I liked the flashbacks, they harkened back to a simpler time -at least at first- where everyone was a lot happier and things seemed a bit more Utopian than Dystopian. It was also nice to see a softer side to Clark as she was nestled in the relative safety of her family. The conflict in the present was well done, both Clark and Wells presented good points around what went on and I like that Wells doesn’t back down from his beliefs. Aside from a hamfisted reconciliation this is all good stuff. Interesting to see some humanity to Bellamy when he confronts a young girl named Charlotte who is struggling with the situation and has nightmares etc – you know, standard little girl stuff when put in scary situations. Also, I liked that he wasn’t interested in holding a grudge against Adam now that he had served his punishment, there’s room for redemption for this guy yet. SPOILER ALERT but Charlotte is proving to be quite the little psychopath, I did not see the brutally cold blooded murder of Wells coming. The way she justifies it by innocently saying it’ll stop her having nightmares is just incredibly dark. I didn’t think this show had the grapes. In conclusion, a great effort and I’m actually looking forward to the next one a great deal, let’s hope that this run of quality can continue. This episode is cleverly scheduled as it takes place before the events of Captain America: The Winter Soldier which came out April 4th in the states, the next episode will presumably take place during/after. It’s all plot this episode for a change, S.H.I.E.L.D are rapidly closing in on the illusive Clairvoyant -or so they think- and formulate a plan to catch him and end this once and for all. Coulson has some help here in the form of returning Agent Garrett and Triplett and Blake as well as outside support from Agent Hand. Everybody is split into teams of two and sent out to the locations of Clairvoyant candidates to try and catch him which just gets Agent Blake attacked and almost killed by Deathlok. After regrouping they begin the search again which leads them to some intriguing double crossing. I actually enjoyed this episode but it was really light on character moments, good or bad. The structure of people being split into teams of two provided an easy stage for those sorts of moments. There was a very good moment between Skye and Garrett that did seem very genuine and Deathlok is nicely sympathetic, really felt for him when he said that “Mike Peterson is dead”. I really hope that this character will be at least a recurring mainstay on the show because he’s one of the better things in it. There were some questionable choices in the episode though, Brad Dourif as the heavily handicapped Thomas Nash pretending to be the Clairvoyant was a confusing casting choice as he has little to do but sit there and doesn’t really have much in the way of screen time before Ward kills him. Ward’s motivation for that was also choppy, I never believed that the character that has been set up during this season would do such a thing as he seems more collected and professional than that (other than when he’s under some outside influence which seems to be happening a lot to him) so his emotional outburst there makes no real sense. Deathlok leads them to the room with Thomas Nash in the most obvious set-up that I’ve seen in anything for a while. 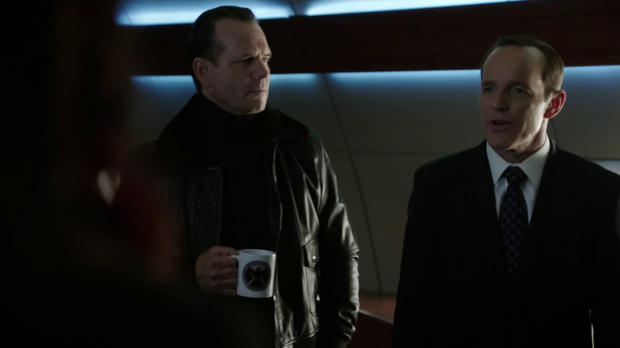 The fact that it takes so long to dawn on Coulson is nothing short of laughable, there seems to be frequent character assassination going on with regards to Coulson in this show so that it can service the plot, it’s really not good enough. The end of the episode is intriguing enough in that Mae’s betrayal finally comes to light and the audience gets the reveal that Hand is up to no good, as if that wasn’t obvious before. I also liked the use of Fitz and Simmons here. Simmons is learning how to be more covert when she agrees to be assigned elsewhere so she can surreptitiously analyse Skye’s blood to find out more about the drug that was used to effectively resurrect her. Overall an above average episode of this show which is brought down by the above mentioned character assassination and nonsense that goes on to make the plot work. Back from a random hiatus to one of the funnier episodes of the season. 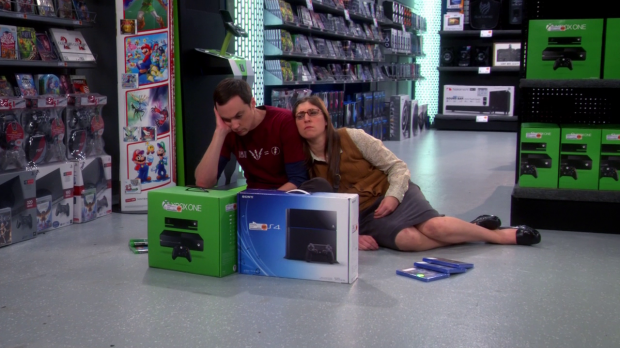 Sheldon is torn between buying a Playstation 4 and an X-Box One in the main plot and Penny is unsure whether to take a role in a terrible horror movie sequel in the main sub-plot. Interesting that the title relates to both stories. There is another sub-plot where Raj has the opportunity to date two women, another indecision. Sheldon’s thought process as he struggles to make up his mind is hilarious, him driving Amy to near madness is fantastic, especially in the scene where she sarcastically humours him and he takes it seriously. It’s great how Amy has developed into this somewhat world savvy person while Sheldon remains more or less static. I really liked the moment where Sheldon reflects on going by his instincts and in each instance he has turned out to be wrong (choosing betamax and HD-DVD as well as choosing a Zune over an I-Pod), his unique brand of childlike frustration is as good as ever here. Penny’s plot is also very good, the highlight being when she speaks to Wil Wheaton who tells her that doing bad movies can be soul crushing. Wil’s expression as he says this is priceless. The reveal at the end when Penny decides to do the film is equally hilarious. Raj’s plot is what lets the episode down, his date with the girl where he pours his heart out about his ex-girlfriend isn’t as funny as they are aiming for and there are genuinely less funny moments within this story. I’m also feeling more sorry for Raj these days which makes it hard for me to laugh at him. Overall a fantastic episode with some first class Sheldon moments brought down a little by a weak Raj subplot. I wrote a full review of this episode since I liked it so much, I’ll do a hyperlink once I actually post it.